* Please Note: The fireplace's Middle Width must be at least 26.5 Inches and the Depth must be at least 12 Inches for this gas log set to fit. You can calculate the middle width of your firebox by measuring the width (left to right) approximately half way back in the firebox. If you have any questions, please contact our customer service department and we will be happy to assist you in finding the perfect size gas log set. 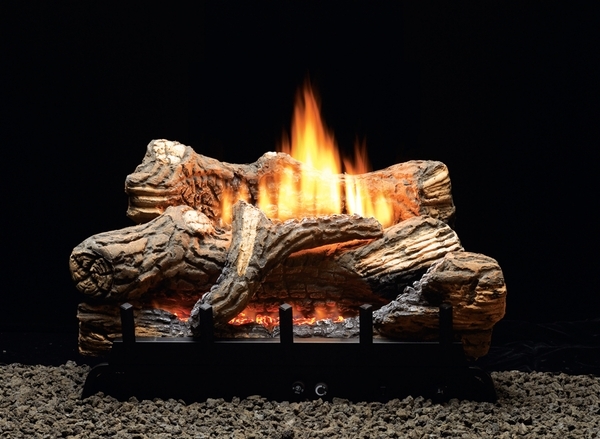 This beautiful set of ceramic fiber gas logs in contour design comes with a vent-free burner that eliminates odors, gases, and smoke. Equip your home with one of our stunning and realistic looking gas fireplace burners and put an end to hauling in wood, cleaning up ashes, eliminating soot and billows of smoke. This compact burner only requires 12 inches of depth in your fireplace in order to operate and give you a real wood burning feel. Completely made in the USA, a gas fireplace is the modern way to heat your living room, den, or even master bedroom, and to add additional character and ambiance. Does this come with the grate? It does have a grate. Assembly was simple out of the box. Set up was a breeze. The instructions were clear. The only negative - the selector knob feels cheaply made. Otherwise, a great product.